Craig is partial to the .300 Wby. Mag., but he admits with modern powders its edge over its competitors has narrowed considerably. 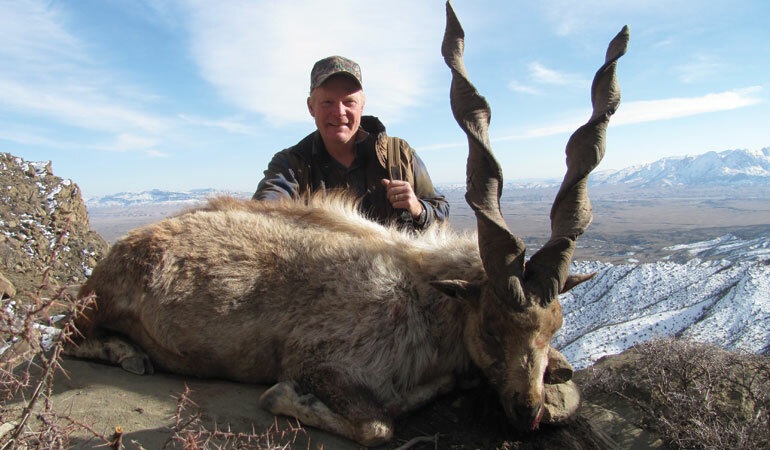 He used the Weatherby to take this Suleiman markhor in Pakistan. A friend of mine calls them the “dirty .30s.” They all kick, and there are lots of situations where they’re just not needed. On the other hand, get a 180-grain .30 caliber bullet going fast (say, in the upper 2000s in terms of feet per second ) and there’s an awful lot such a cartridge will do—and little in the hunting world that a “fast .30” cannot do. The idea of a fast .30 is hardly new. First was probably the .30 Newton, introduced by Charles Newton in 1913. The .30 Newton is a fat-cased unbelted cartridge designed to fit into a .30-06-length action. Performance is about the same as the .300 Win. Mag., but in a case design far ahead of its time. Had it become popular some of our modern fast .30s might not exist, but Charles Newton’s rifle company failed and the cartridge passed into history. In 1925 Holland & Holland necked down its .375 H&H case to create the “Super .30” or .300 H&H Mag. It vaulted into stardom in 1935 when Ben Comfort won the 1,000-yard Wimbledon Match in 1935. The H&H remained the world’s standard fast .30 for 40 years. It is a long, slender belted cartridge that requires a full-length (.375 H&H) action, and its case has a lot of taper and a long neck. Current factory loads are mild, on par with the fastest .30-06 loads, but with handloads the .300 H&H can exceed the .300 Winchester Mag. loads, and that archaic tapered case makes it one of the smoothest-feeding cartridges ever developed. It will never again become popular, but it should not be forgotten. The .300 Wby. Mag. was one of Roy Weatherby’s initial cartridges, developed in 1944. It is an “improved” .300 H&H with full-length (2.825-inch) case, body taper removed to increase powder capacity, and the signature Weatherby “double-Venturi” shoulder. It reaches 3,250 fps with a 180-grain bullet and a 26-inch barrel. It remains the most popular Weatherby cartridge and the flagship of the line. Nobody claims it to be the most accurate fast .30, but it’s been a favorite of mine for nearly 40 years. Winchester introduced the .458 Win. Mag. in 1956, following with the .264 and .338 Win. Mags. in 1958. 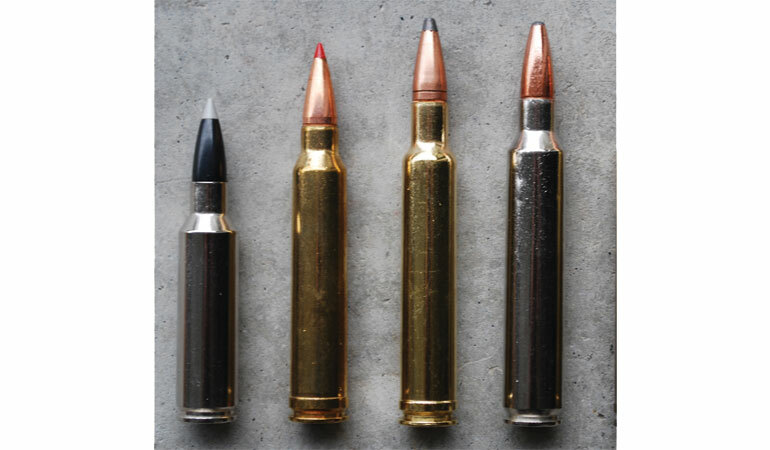 These cartridges used .300 H&H/.375 H&H case shortened to about 2.5 inches in order to fit into a .30-06-length action. Exactly why Winchester didn’t immediately introduce a fast .30 in those years is a mystery, but the company finally introduced its .300 Win. Mag. in 1963. It was initially damned because of its short neck, clearly an effort to wring out all the velocity possible, yet still be housed in a .30-06-length action. Also, old-timers were rankled by the concept of this upstart replacing the honorable .300 H&H. The .300 Win. Mag. struggled through a slow start to become not just our most popular fast .30 but the world’s most popular cartridge to bear a “Mag.” suffix. It propels a 180-grain bullet at around 3,000 fps, so is plenty fast and powerful. I have found it very accurate, validated by its wide use in the sniper community from the first Gulf War to the present. From left: 3 .300 WSM, .300 Win. Mag., .300 Wby. Mag., .300 Rem. Ultra Mag. These are just a few of dozens of magnum .30s. Some are faster and some theoretically more accurate, but all perform similarly. Another flurry of fast .30s—a move away from traditional designs to short, fat and unbelted—entered the market at the turn of this century. Legend has it that Remington already had its Short-Action Ultra Mags on the drawing board, but Winchester beat them to the punch with the .300 Win. Short Mag. in 2000. Remington soon followed with the .300 RSAUM, and in 2007 Hornady introduced the .300 Ruger Compact Mag. The .300 WSM, RSAUM and RCM are ballistically similar to the .300 Win. Mag, but all fit into short bolt actions. When it comes to speed champs, the .300 Wby. Mag. is no slouch, but the .30-.378 Wby. Mag. is faster—better than 3,400 fps with a 180-grain bullet. And Remington’s .300 Rem. Ultra Mag is right up there as well, although it takes handloading to reach its full potential. The big Weatherby is based on the .416 Rigby case while the Ultra Mag is based on the .404 Jeffery. There are more. John Lazzeroni’s short-action 7.82 (.308) Patriot and full-length 7.82 (.308) Warbird are super-fast cartridges, among the fastest in their categories. Blaser has a .300 magnum based on the .404 Jeffery case, but it’s not marketed here in the U.S.
A similar cartridge to the Blaser, and one that is available to American shooters, is the relatively new .30 Nosler. It is sized to fit into a .30-06-length action and produces 3,200 fps at the muzzle with a 180-grain bullet. There’s also a 210-grain load that rips along at 3,000 fps. I’ve tried almost all the fast .30s and have hunted with most of them. It depends a lot on what you need and want—and how much recoil you are comfortable with. In terms of availability there’s no discussion: The .300 Win. Mag. wins, hands down. There are few situations where more is really needed, but if you insist, then the .300 Rem. Ultra Mag, with its larger-diameter unbelted case, is hard to beat. However, genuine gains from case design alone are difficult to measure. I keep coming back to the old .300 Wby. Mag., but I have to admit that with modern propellants the velocity gap between the .300 Wby. and the .300 Win. is narrower than it used to be. As for the short-cased .300s, all do exactly what their manufacturers say they will do which is, more or less, to emulate .300 Win. Mag. ballistics—except they do it in shorter actions and are more efficient in shorter barrels, thus can be built into lighter, handier rifles. The .300 WSM is, by far, the most popular of the group. If you place a big premium on gun weight then one of the short magnums may be a good choice. In general, if you just want the capability of a fast .30, then get a .300 Win. Mag. and call it done.